what? I didn't say anything. when? The following takes place between 11pm and 4am. why? I don't know, you tell me. After months of secrecy and posting scant details on their project blog, Dusty Davidson and his band of interns from Omaha software development company Brightmix, release BetterOmaha.com, their web app aimed at improving the way Omahans find local news. This project spawned from the need to have a news source that aggregates everything happening in Omaha without subjecting a user to seizure inducing page layouts, pop-up ads, and ridiculous peel down advertising (*cough* Omaha.com *cough*). The site will scrape all Omaha news sites and aggregate the information in one convenient, well designed place. Users can setup profiles with custom RSS feeds that will deliver the news from the sources they specify. 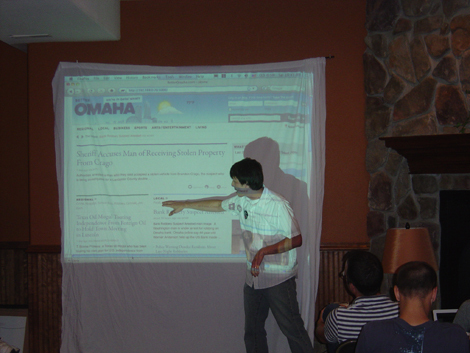 Users will also be able to search for local news via BetterOmaha.com and find archived stories that one might not be able to normally find (i.e. Omaha.com only allowing search on their site from the last 7 days of news). Think Google News but custom tailored to the exact needs of people looking for Omaha based news. This blog is looking forward to checking out BetterOmaha.com and will post a more in depth review in the near future. Congratulations to Dusty, Kevin and the rest of the team at Brightmix. Editor Note: As of this writing BetterOmaha.com isn't live yet, might be due to DNS issues, but the site should be live soon. BetterOmaha.com is now live. Note that the service is still in private beta in which you'll need an invite code to use the site. Dusty handed out a bunch of beta codes after his presentation of which I grabbed a few and will be willing to send out some codes once the site is active. Today I'm live at the first ever Barcamp held in Omaha. If you don't know what a barcamp is, head over to BarcampOmaha.org to learn more about today's event or visit the main Barcamp website to learn how you can start one in your neck of the woods. I'll be writing a few blog posts throughout the day about topics I sit in on and will also be providing updates via twitter. You can follow me on twitter www.twitter.com/joeschmidt. Also be sure to check out pictures from Barcamp Omaha on Flickr. Attendees will tag their photos with barcampomaha. Aromas in downtown Omaha's Old Market district Saturday night was the site for the first "official" Omaha Tweetup. What's a Tweetup you ask? In a sense, it's a networking event, but more importantly it's a chance for local Omaha Twitter users to meet face-to-face, find out what other Twitter users do and where their interests lie. Last night's Tweetup saw 13 people in attendance including one Twitter user who came all the way from the great state of Texas to be with us. An essential part of any Tweetup is the name game, where everyone goes around and talks about who they are, what they do, and why they came to the Tweetup. Other parts of the evening revolved around discussing Omaha's first Barcamp and the creation of a new co-working space in Omaha, which are two exciting projects on the Omaha horizon. All in all it was a great night of discussion and I look forward to more Tweetups in the future. If you couldn't make last night's talk be sure to check out the Omaha Tweetup Invite page or follow @OmahaTweetup on Twitter. A chronological list of every post. Legal Disclaimer: Overuse of JoeSchmidt.com has been proven to cause male pattern baldness in laboratory animals. Your results may vary. Use as directed. Consult a physician before use. No animals were hurt in the production of this weblog.